The Payne Whitney Gymnasium is a massive complex consisting of 5-story wings to the east and west of a 9-1/2-story tower, comprising a total of 640,000 square feet. 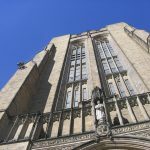 The tower of the Payne Whitney Gymnasium rises nearly 230 feet above the main entrance on the south side of the building and adjoins the east and west wings of the lower building at the fifth floor level. Like the rest of the gymnasium complex, the tower has a steel frame with a composite masonry exterior wall comprised of brick faced with stone. The buff-colored Ohio sandstone used at the exterior is tooled with different patterns in the field of the walls and is smoothly dressed at the trim and window surrounds. Elements of Gothic massing and decoration, such as a crenellated parapet, corner buttresses and pointed arched window openings with leaded glass and ornate stone tracery, give the gymnasium the appearance of a cathedral. 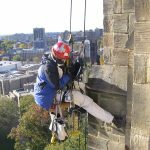 Surveyed and documented existing conditions at exterior of tower. Collected material samples for analysis and testing by project conservators.